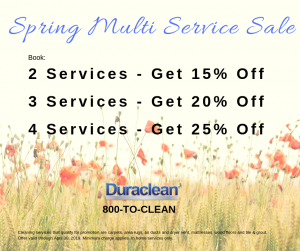 To show our support for the men and women currently on active duty in our military, Duraclean will provide 1 cleaning service per month free of charge. The customer must be on active military duty and show a valid I.D. Services will be provided on a first come, first serve basis. Stop guessing which cord on your power strip goes with what: Save the plastic tags from loaves of supermarket bread, write the name of each device on a tag and clip it around the relevant cord. Organizing shoes heel to toe maximizes space and gives you a quick survey of color, toe style and heel height to help speed up getting dressed. Missing a sock? This organizer will help you match up the missing mate if or when it does resurface. Why does it seem like you’re the only one who ever replaces the TP? Encourage other family members to follow your lead. Hang a Diagram. Use post it notes to clean keyboards. Fold note in half with sticky side on the outside. Run note between each row of keys. Use tongs to dust your blinds. All you have to do is secure a microfiber cloth onto the tool with rubber bands, then pull the cloth across each strand. The cloths can also be wet to use on blinds that the dry cloth just won’t clean. Save space by corralling bottles on lazy susans. Sandwich two baking tins with some marbles in between.